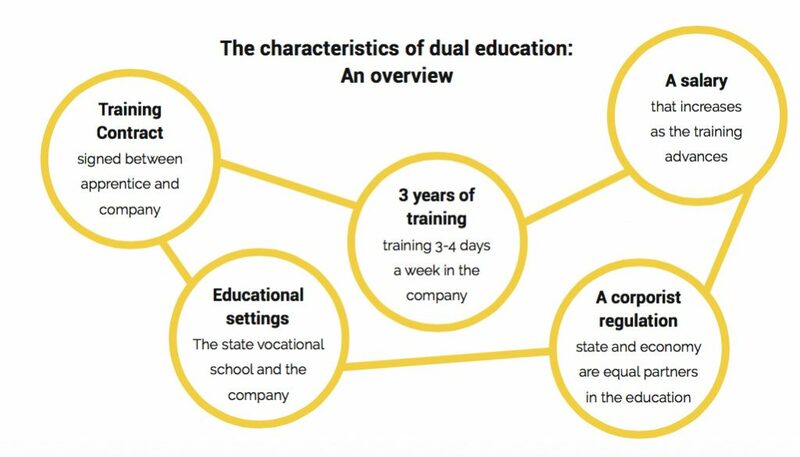 The concept of dual studies is increasingly getting in the focus of interest of high school graduates, corporates and education politicians worldwide. Besides, this format is praised to be the key to employability. But will dual studies become the backbone of the contemporary German economy as many predict? And what about the transferability of this study model to the international economies? The roots of vocational training lie in the pre-industrial age of Germany. Back then, when the guilds were representing what we today know as the professional associations, it was customary in some cities to train apprentices practically in the craft sector. The latter had to attend even final examinations, which were defined and implemented by the guilds. In the course of history, and especially during the industrial revolution, the craft enterprises got under increasing pressure, though. Manufactures, liberal views on professional and trade freedom and the rigid nature of the guilds ultimately led to the end of the then known vocational training model. Every country reacted differently to the industrialisation of the economic processes. Germany passed the Handicrafts Act (1897) and handed the responsibility for the regulation and implementation of the practical training of the country’s apprentices over to the craft chambers. Later, the German industry also followed this training model and developed it further in line with the labour market requirements. From 1969 onwards, the German State is the second central player in the regulation, implementation and promotion of the vocational training, and still plays an important role. Ever since, the vocational training, known in Germany as “dual education”, has been uniformly regulated all over the country. What began in October 1974 as a pilot project with 164 high school graduates and 50 companies from the regions around Stuttgart and Mannheim, has now developed to a successful higher education concept for Baden-Württemberg. For the first time in the recent history of the dual training concept, the high school graduates, who enrolled back then for their studies at the Berufsakademien (Vocational Academies) in Stuttgart and Mannheim, were taught by their professors and additionally by specialists from various business enterprises at the companies’ premises. That way, the foundations were laid for the establishment of an educational institution, which enables and further develops such a “dual higher education”: the Cooperative State University of Baden-Württemberg (in German “Duale Hochschule Baden-Württemberg”, abbreviation DHBW). But What distinguishes the DHBW from the training-on-the-job-model? If you look at the university landscape of Germany and on the regularly appearing worldwide university rankings, you will see that there are so many different study options as there are opinions about the courses quality. The advantages of a concept like the DHBW consist, on the one hand, of the altering theory and practice phases and, on the other hand, of the close cooperation with the economy. Nevertheless, one should consider the DHBW for more than just a brokerage event where the students can meet the one or other famous business partner. As the name suggests, the central feature of the Cooperative State University of Baden-Württemberg (DHBW) is its dual study concept. At the DHBW, students change their learning environment between the lecture room and the employer’s premises every three months. During their residence and active training at the employer’s site, they acquire professional knowledge and practical Know-How, as well as the necessary work and social competences needed in their later professional routine. Theory and practice contents are closely aligned with each other and the curricula are determined by the training staff to comply with current developments in business, technology and society. The achievements in the practical phases are an integral part of the studies. What characterises the labour market in Germany? Over the last ten years, employment in Germany has grown steadily to the highest level since the country’s reunification in 1989/1990. By the end of 2015, there was an increase in employment in almost all sectors and in all Federal States, and the trend remains upward. Among those sectors, the manufacturing industry is and remains the largest one in Germany, with about 6.7 million employees. Slightly smaller employment rates show the trade sector (4.25 million), healthcare (2.3 million), qualified company services (2.25 million) and care and social services (2.08 million). At the same time, though, the importance of other industries is reduced considerably, like, for example, the construction and the manufacturing industry, the commodity and production industries, capital goods and consumer goods manufacturing, energy and water supply. Having the above said in mind, it is obvious that the job demand is shaped considerably in accordance with the labour market situation – and indirectly in accordance with the offer and demand in the field of vocational education. It’s a fact that the labour market situation in Germany depends to a decisive extent on the dual education system. Today, the unemployment rate of young people up to 25 years of age has more than halved compared to 2005 – in 2015, 239,000 unemployed young adults were counted in the Federal Republic. In the generation of 25-years-plus, 54% are permanent employees and, among those who have completed a dual vocational training at a company, 66% were taken over and employed long-term. So, are dual studies the backbone of the modern German economy? Despite the promising numbers, there has been a significant change in the German vocational training market over the last ten years. While in 2005 there were more applicants for training courses than actual workplaces within the companies, today there are as many training places as there are applicants. However, regional, professional and qualification difficulties disturb this balance. At the regional level and specifically in the Federal States of Berlin, North Rhine-Westphalia and Hessen, sufficient company training centers were missing up to the year 2015. In Western and Southern Germany, and among those States also in Baden-Württemberg, the situation looks better, but also has a downside: here exists a saturation in the demand within certain work areas. In particular, the commercial area, the media sector and the artistic and creative professions like Media design and marketing are just before demand saturation – those are the predicted numbers for 2016/2017. The fields looking with increased worry for trainees are commercial trade, hotel and catering professions, food production and sale, as well as the branches of construction and precision engineering and tooling technology. The above listed disparities generate doubts about the future of the success story “Dual Studies”. One thing is clear: in order to remain attractive to the economy and the applying young adults, the dual education system has to adapt continuously to the developments on the labour market. Considering the changes and the demand for qualified personnel in the professional structure as this has been introduced above, new promising training programs are an important starting point for making the dual studies model attractive again. Particularly in the framework of the increasing digitalisation trend in the workplace, carriers of the dual training, including the DHBW, have to impart economically relevant competences to the young people and interested experts. The DHBW is the first practice-integrating dual university in Germany. Since its foundation in 2009, it follows the goal of creating a practical alternative to classical studies and already has received full recognition under university law. Today, around 34,000 young people are studying at the twelve DHBW-locations – an increase of over 10,000 students compared to the year of foundation. 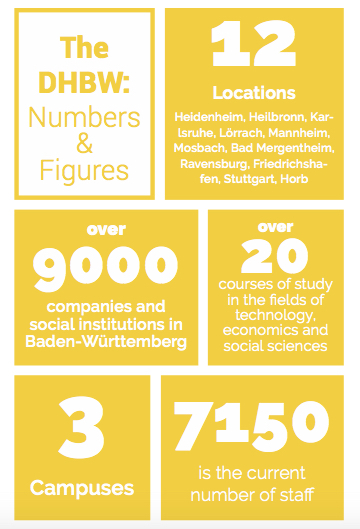 Today, the DHBW counts as one of the largest higher education institutions in the German Federal State of Baden-Württemberg. This article can be found in full length in our magazine, which will be on the market by the end of April.